We are living the cliché that says that when you have kids, your pets plummet on your list of priorities. When we brought Rowan home from the hospital, our beta-cat, Creemore, briefly saw him as an opportunity for advancement in the pecking order. Within seconds of us laying our newborn son on the sofa, she attacked. Twice. 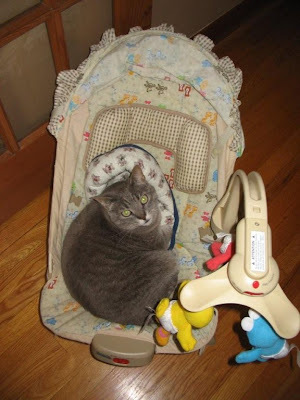 Imagine a flash of grey fur and extended claws covering your brand-new baby. Rachel threw the cat across the room, twice, and then locked her in the office for hours as she seriously contemplated euthanasia. And this is the cat we used to take with us — on the airplane — when we went away for long weekends. We expected trouble when Isaac arrived, but by then Creemore had learned her lesson. As the midwife conducted the newborn exam on our bed, the cat stretched out next to him, curious but respectful. Since then, she’s mostly stayed out of the kids’ way. Today, the cats seem more like innocuous roommates than cherished pets. Except that they are woefully behind on their rent. Every so often I will see one of them sleeping on the bed or descending the stairs and be mildly surprised. It’s an odd thing, really, to have animals living with you, right in your house. Think about that: we have two animals living right inside our house. Crazy. Why cats and not, say, squirrels? And then there are the times when I watch the boys and think, why children and not cats? I watch as Rowan runs shrieking through the dining room as he unspools the retractable cord from the vacuum cleaner. I watch Isaac empty a cupboard of pots, break into impromptu little dances, bestow kisses on my knees, treat the other parents in the Kindermusik lobby to impassioned gibberish soliloquies. And I think, who are these strange creatures with their strange rituals who live in our house with us? And how did they get here? And why children and not, say, order, sleep, trips to Venice? I’m convinced, actually, that the cats are thinking the same thing. Maybe not that part about Venice, but they must wonder about these two loud little beings with their sudden, jerky movements and oppressive love. Isaac first word was “cat.” For as long as he has been sentient and at all mobile, he has gravitated toward the wee beasties. “Caaaaaaaaaaaaaaaaaaat,” he’ll say, lurching toward one feline or the other. Creemore just runs away, but Lola, our big, black, snarky queen, has proved remarkably tolerant. She’ll lie quietly as the baby mauls her and covers her with kisses. In the last week or so, he’s become much more skilled at the art of petting her. “Niiiiiiiiiiiiiiiiice,” he’ll say, over and over, as he strokes her fur. “Niiiiiiiiiiice.” Rowan scratches her behind her ears, “with four fingers. See, Mom? You do it with four fingers. Like this” — and he holds up his hand to show me. “See?” I swear I’ve even heard Lola purr as they descend upon her. As Isaac sheds his babyhood, marching on two feet inexorably towards language, molars, cups without lids, I notice his almost daily capacity to surprise me. Just the sheer presence of this grinning little boy standing up in his crib at the end of his nap, answering my questions when I expect only silence, pointing, spooning oatmeal into his mouth all by himself, is a bit of a revelation. Each day, he becomes more and more his own person and less (dare I say this?) pet-like. Each day, he becomes more deliberate, a part of the family with his own opinions, his own preferences, his own rituals. One day in the next year or so, he’ll sleep in a big-boy bed, just like his brother. And one day I will go into his room to check on him and find, as I did the other night when I went to check on Rowan, a grey cat curled up next to him. Purring.